Oh who am I kidding. It probably won’t be short. But it might be disjointed. My good intentions were foiled by intermittent Internet access at the Super Conference, which was not that unexpected. And by a seriously limited amount of power for my computer, which was totally unexpected except for my expected ability to do boneheaded things like leaving my power adapter at home. I do have something to say about peer reviewed research today though – it’s about this 2005 Library Quarterly article by Kimmo Tuominen, Reijo Savolainen and Sanna Talja. Fair warning, I really liked this article. I first read something by Savolainen when I was working on an annotated bibliography in library school (I think the topic was genre) and I’ve been something of a fan ever since. Like AnneMaree Lloyd who was discussed here two weeks ago, these authors argue that we need to expand our definitions of information literacy. And the expansion they’re arguing for is similar to Lloyd’s. I find more food for thought here – more connections between the different things I’m thinking about and working on. Perhaps this is because this is not a research article – these authors are not bound by their own sample, questions, or data. Perhaps it is because tthey do a better job of placing their vision of information literacy in its theoretial context, or at least of explaining what that context is and why we should care about it. Or perhaps it is just because their vision is broader. The predominant view of information literacy tends to conceive of IL as a set of attributes – or personal fluencies – that can be taught, evaluated, and measured independently of the practical tasks and contexts in which they are used. We argue that understanding the interplay between knowledge formation, workplace learning, and information technologies is crucial for the success of IL initiatives. Needs for information and information skills are embedded in work practice and domain-dependent tasks. So from here the authors look back at the IL discussion over time. They locate its start in the 1960’s and early 1970’s, trace the initial involvement of professional associations in the 1980’s, touch on the Big 6 model in the 1990’s and then argue that the concept of information literacy began to be associated with the broader concept of lifelong learning in the 1990’s. They conclude this history section with the argument that since the 1990’s there have been many attempts to define competency standards for information literacy. From here, they move to talking about challenges to the idea of information literacy. Interestingly, they place the argument that IL instruction requires cooperation with faculty, integration into the curriculum, and a grounding in content-focused classroom assignments as one such challenge. Given that that model has been presented to me as the norm (with the separate, credit-course instruction idea as the exception) since I was in library school, this rang a little strange to me. The authors dismiss the challenges to IL. They argue that so long as definitions of IL take the individual as subject, and outline a set of generic, transferable skills that individual can master – there is broad agreement as to what the potentially vague concept of “information literacy” means. They argue that the ACRL IL Standards for Higher Education, for example, define a set of generic skills that are supposed to have relevance across the disciplines and across contexts. This is very interesting to me, because we spent a long time on my campus defining just that kind of generic, transferable information literacy standards. We did so in conjunction with faculty across the disciplines – from all of our colleges and who taught all levels of undergraduates. The thing is this, this was a really invigorating process. We held focus groups with faculty and had conversations with a lot of programs and units across campus and I’m really, really proud of the document we came up with . As a model for objectives/ goal-writing, this document is not bad. Look at the action verbs! And more than that, the repeated conversations with faculty were really morale-boosting. Getting faculty to come over to the library and talk, and talk in-depth and really, really intelligently about information literacy wasn’t a challenge – it was easy. And the faculty had such useful and smart things to say about the stuff we all cared about. It was a good process. Since then, we’ve been wondering what to do with the document. Our campus doesn’t have any instiutution-wide learning goals; we don’t have a structure where our competencies could fit in or be adopted on a campus-wide level. So that’s an issue. But even within the library, we’ve struggled with where to go next. And I think that the factors mentioned in this article may have something to do with it. We use the course-integrated, there should be an assignment, IL has more meaning with taught in the context of an actual information need model. And we thought and still think that we *could* define disciplinary or context- specific versions of our competencies (or at least of the examples), but we haven’t done that. Our one attempt to do so got bogged down in a nightmare mire of granularity. We want to define a program that integrates the branch campuses, the archives/ special collections, faculty programs and all levels of graduate/undergraduate student instruction and I’m not sure that the competency document is that helpful in doing that. It was a useful reflective exercise for us, and the process of creating it collaboratively with faculty was very useful. But beyond that, I’m not sure how to make it useful for us as we try to structure a doing-more-with-less type of instruction program. And it might be because of what is articulated in this article. When I think of how to create a document like this for beginning composition, for example, which while multidiscipinary has a clearly articulated goal of introducing students to academic writing and knowledge creation. And that goal is a context – academic writing provides a context. Context is even easier to conceptualize in different fields. Most of the published IL literature draws from constructivist theories of learning stressing that individuals not only absorb the messages carried by information but are also active builders of sense and meaning. What they’re missing here, or probably not giving the same emphasis that I would give more than ignoring – is Vygotsky. Kuhlthau, who they acknowledge as influential, deliberately focuses on Vygotsky’s brand of constructivism, which was a deliberate effort to integrate the social and cultural back IN to constructivism. Still, much as I love Vygotsky, and much as I respect Kuhlthau for going that route — I have to agree that the *image* of the solitary scholar undergirds the picture painted by most IL competency standards. Which is why I think the “academic writing” context in beginning composition is not too broad as to be useful. For new or neophyte scholars, the idea that there are practices of communicating knowledge, that there are types of knowledge more avalued than others – these ideas are new enough that they deserve an introduction all their own. Expecting students to jump into the epistemic community of a discipine before they really understand that there is such a thing as epistemology… that seems unreasonable to me. The authors here tend to argue that IL is too grounded in school and that it misses the communitie of practice aspect because it’s too grounded in school. I think I would probably argue (though this just occurred to me and I’m a classic introvert which means I need more processing time and thus must reserve the right to argue the opposite of this later) … anyway … I would probably argue that the problem isn’t that we focus on generic academic writing skills instead of grounding things in context – I would argue that we present generic academic writing skills without really grounding them in their context. I agree that we have an assumption that these skills, mastered in any context, will be useful and valuable. That we don’t have to explain their significance across contexts because students will be able to draw those connections. I’m not sure that’s true unless we specifically, and deliberately, explain the academic context in the first place. And I really like the idea of grounding those pieces of information literacy – that what you will even be looking for is determined by the discourse, by the practice-standards of a particular discourse community — in the community or the context. So, to these authors, “sociotechnical practice” means identifying where the community determines what it means to be information literate. And that’s really, really valuable. Beyond this, I think we need to start deliberately teaching our students how to figure out what those community standards are. Not teaching them what they are – but how to figure that out. I wondered the other day if students are using search engines to figure out how to enter the scholarly discourse even if they aren’t taught specifically what “peer reviewed” means, or anything like that. Looking at my referral logs, I don’t think they are. That kind of bothers me – they should know how to go looking for the how-to information they need. And I suspect we should start teaching it. I gave a short presentation on assessment at the 7th Biennial Conference on University Education in Natural Resources on Saturday. I don’t usually get the chance to attend specific discipline-focused conferences like this, even those about the scholarship of teaching and learning, and if UENR hadn’t been hosted by the OSU Colleges of Agricultural Sciences and Forestry, I never would have attended this one either. I took advantage of my registration to see some sessions and now I just wish I had cleared out my Friday earlier so that I could have seen more. One of the first sessions I saw came out of Northern Arizona. Tom Kolb described the development and implementation of a sophomore-level, discipline-specific class on Writing in Forestry. The whole presentation was interesting, but I just want to focus on this one piece that I think ties in well with the academic article template I linked to last week, as well as to some of the work we’re doing here at OSU in beginning composition. The TA’s that NAU’s school of forestry hires to work as writing consultants usually come from the English Department’s applied linguistics program. These students have the experience writing about data, particularly quantitative analyses, in a way that works well for teaching forestry students how to write in that discipline. But as a bonus, they can also bring their research into play. He presented data gathered by an NAU writing consultant TA, using corpus linguistics — a systematic way of analyzing large bodies of text (corpora). In this case, they looked at the body of text produced by the students in this 200-level writing class, and the body of text produced by professional scholars and researchers in forestry (by looking at articles published in a selection of forestry journals). The two pieces of data that he presented were – a comparison of the students’ and the researchers’ use of verbs, and a comparison of the students’ and the researchers’ use of linking adverbials (terms like also, then, therefore, i.e. or e.g.). Initially, when I heard about the research method, I was thinking about keyword selection and how difficult it can be for novice writers to predict the kinds of terms that scholars will use in their writing — and the problems that creates for the novices’ keyword searches. But the language uses he was looking at were more structural, and the results were fascinating — with verbs, for example, both the novices and the professionals used the same two verbs the most: “find” and “show.” But the professionals supplemented those two verbs with a big list of additional terms. The novices, on the other hand, used “find” and “show” almost exclusively. Similarly, with linking adverbials – the novices picked up on the most commonly used terms, but did not use most of the terms professionals used much at all. This I think could be really instructive for students — as a very non-threatening way to show them how writing for different audiences (scholarly/popular and disciplinary audiences) is different. At NAU they do share the data, and the students ask for copies of the pros’ lists, so they can incorporate those terms in their own writing. You can find Dr. Kolb’s full paper here (opens in Word). What __________ really means by this is ______________. Having just argued that __________, let us turn our attention to _______________. My colleague Kate asked if the NAU assignments made students better readers of research articles – which I thought was a great question. And it gets at the reason I’m thinking a lot of these approaches that seem overly prescriptive at first might be really valuable for a lot of our students. It’s one thing to prescribe content, but when it comes to form — the format of a lot of academic writing, from the citations to the headings to the titles, is prescribed. For all of us. Spelling out the how and the why of that format can not only help a student think about their own ideas in a new way (is there a difference if I use “show” or “suggest”) but can also give them some insight into why the articles we’re asking them to use are written the way they are, so they can read them more strategically, and more effectively. This isn’t really a continuation of the Caleb Crain post, more like something you might find on the shelf nearby. 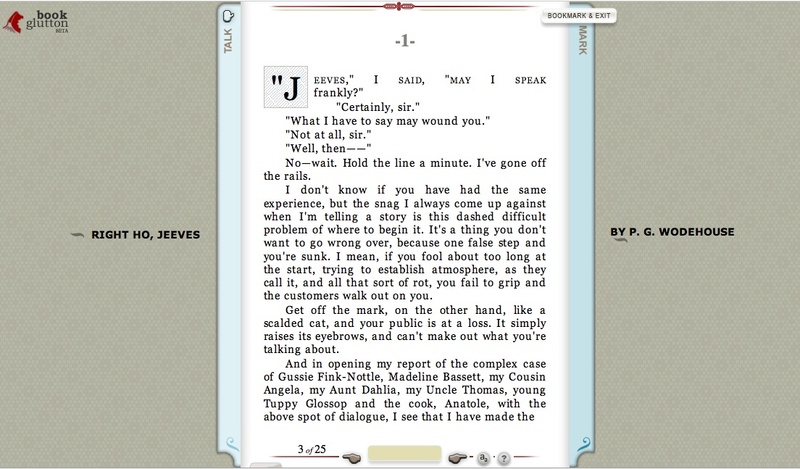 First there’s this project, kind of like social reading — Book Glutton. They are operating on the premise that the time when you want to take notes about a book, or talk about a book, is while you are actually reading it. 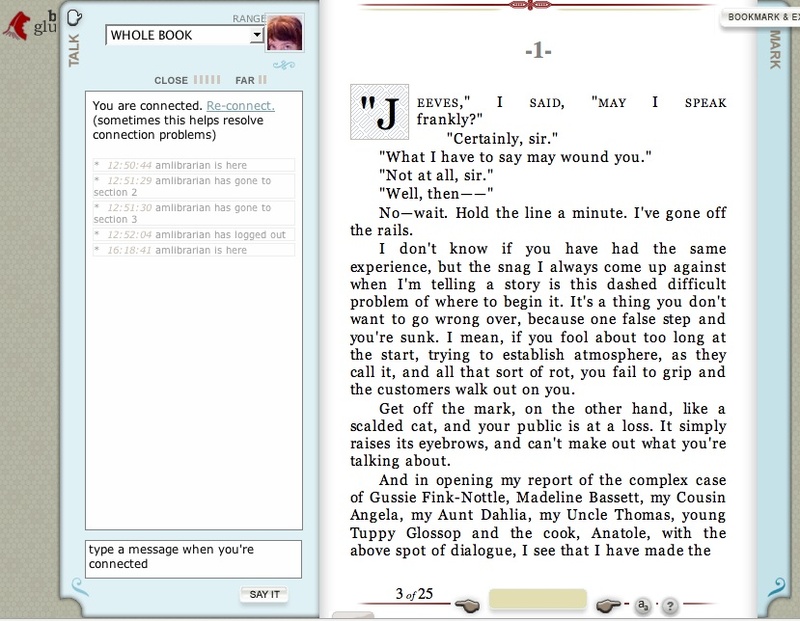 So it’s part online book reading thingy, part book-related social networking site. You can read alone, or you can join a group reading a book together. What I find kind of interesting though, is that they’re taking “reading together” a lot more seriously than “join a group of people reading the same thing.” Which anyone already can do in a lot of places online. And that’s what I actually find interesting about this site – that the basic premise is that people would rather read books together. I think this goes against a lot of our notions about curling up with a good book, in solitude and silence except for the rain drumming on the roof. Or the idea of “losing yourself” in a book – that doesn’t seem to have a lot of room for other people in it. But maybe that kind of reading only appeals to some, or only appeals in the abstract. As the Stumbing Funsters, currently reading Alice in Wonderland, say — Rock on. We read, bub. We read. Mostly in the evenings, when we’re feeling social, btw. So maybe there are a lot of people who would rather do their reading like this? On laptops, in coffeehouses, together? Or maybe this is a different kind of reading? Then there’s this project, which is very different. Really, there’s nothing tying these together except in my head. Where Book Glutton is largely replicating the physical act of book-reading, the “digital art publisher” tontonium goes somewhere else. The digital fiction, The Reprover was mentioned on the if:book blog today, and it looks like a fascinating re-visioning of one thing “reading online” might mean. It’s something that you have to buy, and I haven’t yet. But I’m thinking that if I can convince myself that it will help me with my French, I might be able to justify the purchase. 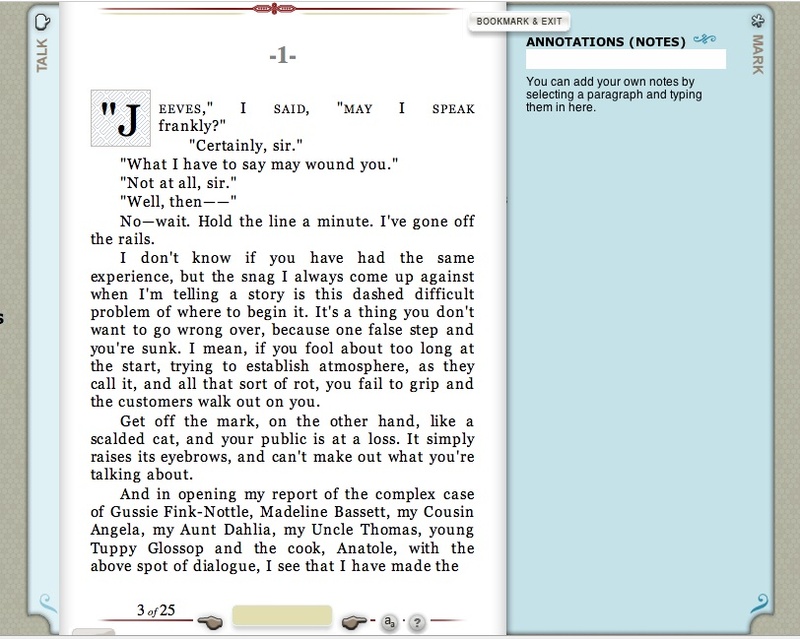 a witty text in French and elaborate English which expands and contracts – the same sentence blooming different additional clauses each time you pass a mouse across it. This is a deeply disconcerting effect at first, but once you’ve got used to it, a whole new kind of three dimensional reading emerges. It’s a fascinating idea which could only work on the web. I think I’m going to have to justify buying it, just to see that. The Royal Family apparently started a YouTube channel about two months ago, but I don’t think many people over here noticed it until it came time for the Queen’s annual Christmas message. At least, I don’t remember seeing anything about it two months ago, but I’ve seen it mentioned on three or four blogs this week. I’m trying to figure out why I think this is such a good idea. If the Bush Administration suddenly started a YouTube channel, I wouldn’t think anything good about it. And I don’t think that’s entirely partisan. I don’t see myself watching 20 minutes of old Clinton home movies on the morning after Christmas either. But this morning, that’s what I found myself doing with the Royal Channel. An old movie depicting events from the death of King George to Elizabeth’s coronation, followed by a silent movie about the Queen Mother’s wedding and all of a sudden it was 20 minutes later. I think there’s some aspect of admiration for whoever in the Royal Household had the idea of putting video proof of charitable acts and royal family events out "where the people are," to use that tired phrase — but I don’t think that by itself explains why I’m taken with this idea. I think that combined with the kind of information the royal family has available to broadcast in this way — those old videos, the historical stuff — is what makes this seem right to me. Most of the time that’s where I end up losing time on YouTube. Thirty minutes searching for Mario Savio talking about the machine, two hours of old Olympic coverage. This is where my actual time has actually gone in the last year. So that leads me to the question – is this just the historian in me? Am I taken with the royal family channel because it’s way to see historical artifacts I wouldn’t otherwise easily see? Or is this a more objectively cool example of the right medium for the right message?